Walter Archer worked at Stow on the Wold in Gloucestershire from the end of the seventeenth century. Thirty years ago we knew nothing about him; today his work is well known and admired for its individuality and quirkiness. He is a maker I have written about before in Clocks Magazine, namely in the issues of January 1986, January 1989 and October 2000. In 1984 when the late Graham Dowler published his book on Gloucestershire clockmakers he included considerable information on the Archer genealogy, which we took for granted as being accurate. From that we assumed, incorrectly as it later turned out, that Walter was born about 1690, and that caused us to date his clocks to a later period than was correct. Due to more recent research by Barnaby Smith we know that Walter Archer was baptised on the 7th March 1674/75 at Moreton-in-the-Marsh, the son of blacksmith and gunsmith Thomas Archer. The family name was written in the parish registers as Archer or ARCHARD, though whether the clerk felt this was the true earlier spelling of the name or whether it was an attempt to write Archer the way it was pronounced locally is unknown. It may be relevant that on what appears to be his earliest known clock, Walter spells his name 'Waltar Archar', and the fact that he spelled Walter with an a as Waltar may imply he was trying to write it as it sounded. This seems to be the only example of his clocks using that spelling out of something like sixty of his clocks that have been documented. Walter's elder brother, Thomas, born 1670, followed his father in the blacksmith and gunsmith trade at Moreton. Walter's younger brother, Charles, was baptised on the 15th December 1676. Thomas, the father, died in 1722, and left his working tools to be shared equally between Walter and Charles, the implication being that his elder son Thomas was either dead or had adequate equipment of his own. There was probably not enough trade in Moreton to support more than one smith and so Walter and Charles moved together to Stow on the Wold to set up in clockmaking. True to form at this time the eldest son took over the father's business and younger sons scattered further afield to find their own fortunes. The date of their move is not known but could be as early as 1694, the oldest document proving their residence there being a list of inhabitants dating from 1699. Walter worked till at least 1742 and is thought to have died before 1745. His burial record has not been traced. Walter's work is already widely known and here I am concentrating on what we can learn about his work and about the trade more generally from a single, unique clock of his. 1. This lantern clock by Walter Archer dates from about 1695 and is his oldest known clock. About sixty clocks have been documented by Walter (and Charles) Archer - mostly by Barnaby Smith who has documented these things for years. These include something like 15 lantern clocks, plus about six hybrid clocks which were a simplified form of lantern clock with an iron frame. The majority of these were signed 'Walter Archer' with no place name; a few were signed 'Archer Stow'. The example illustrated here is the only one signed 'Waltar Archar Stow'. Whilst most of his clocks have typical anchor escapements, about eight of his lantern clocks were made with tic-tac escapements, of which he seems to have been particularly fond. The tic-tac escapement is very like an anchor escapement but the pallets cover only two teeth of the escape wheel. It allows an anchor-like escapement with a short pendulum and produces timekeeping more accurate than with the verge pendulum. 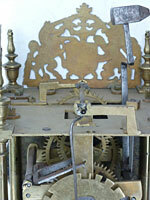 Having tried recently to look up details of when this escapement was first produced and by whom, I failed. Nobody seems to know who invented the tic-tac escapement. It is suggested it might have been Joseph Knibb by whom examples are known from shortly after 1670, that is just after his move from Oxford to London in that year. Another suggestion is that it might have been John Wise, who moved from Warwick to London about that same year and who is believed to have been a cousin of Joseph Knibb. Another suggestion is that Ahasuerus Fromanteel used this escapement around that same time. It seems not to have been known before about 1670, and whoever invented it, it was certainly not Walter Archer, who was not yet born. But Archer knew of it and used it to a degree other rural clockmakers did not. Perhaps his proximity to Oxford had some bearing. The clock illustrated here seems to me to be the oldest clock yet recorded by him, and, if so, we might set its date around 1695. So we can take it he was certainly aware of the tic-tac escapement by 1695 and this seems to be the oldest example yet known of his use of it. He used this escapement later on several, but not all, of his lantern and hybrid clocks, and this escapement is otherwise exceptionally rare in lantern clocks. But why should this clock rank as his earliest? Well there are several reasons of style and construction. 2. The movement has a comical 'bird-beak' terminal to the hammer stop. Many clockmakers made a decorative flourish to the terminal, just for fun, when plain would have worked just as well. First it is signed on the shield of the lion and unicorn fret, the only clock by him to be signed in this place. The lion and unicorn are the 'supporters' of the Royal Arms, which of course correctly would have the Royal arms on the shield. This was a very popular fret pattern in the West Country to show support for the King, originally for Charles II on his Restoration in 1660 as a reaction to Oliver Cromwell's earlier edict to destroy all examples of the Royal Arms. It was used by Archer on all his lantern (and hybrid) clocks, with the shield normally decorated with just a few engraved strokes. On this clock the shield is signed 'Waltar Archar Stow', the only clock he signed that way. It was probably a case of Walter expressing his own individuality, which he often did. I cannot believe a man with his fertile brain had reached the age of 21 without knowing how to write his own name correctly. So he must have done this on purpose. Perhaps his ego matched the size of his brain and he did this to draw attention to himself. No doubt it produced a lot of local comment, and perhaps ribbing, for he soon reverted to spelling his name the 'proper' way, and ever after he engraved it as 'Walter Archer'. It is known that dial engravers, especially rural ones, sometimes used a template to mark out their designs. This would be made of paper or card or perhaps thin brass, and the engraver would pick out the design in a series of dots through holes in the template, rather like those kind of children's games, where they draw a picture by joining dots together. The template was laid onto the dial sheet and a pointer was used to prick out a mark for each hole. It is suggested that sometimes French chalk was tapped through the holes to chalk out the pattern. The engraver then ran his tools through the pricked-out design to join up the dots. How do we know this? Well because some clockmakers, who were less than perfect at engraving, sometimes missed some of the dots. Will Snow of Padside is a good example of this. Of course a skilled engraver might also have used a template, but would have had the presence of mind to make his prick marks very lightly and to polish out any trace of any mark he happened to miss when engraving, just as he would polish out any faint ruled lines he made to keep his lettering straight. Clockmakers engraving from a template tended to use the same design time and time again. Will Snow did that, and so did Walter Archer in his second and third designs. 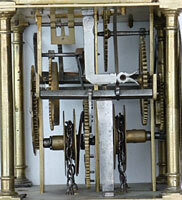 But the Waltar Archar clock pictured here is the only known example of that particular design on his clocks. Nor can I find hat design on lantern clocks by any other maker. We can imagine that clockmakers who had their dials engraved by a professional full-time engraver, would not be willing to accept the same pattern time after time. But those clockmakers doing their own engraving, as I think Walter Archer did, would made do with their best effort at a design repeated over and over again - as he did. 3. The top plate shows the tic-tac escapement, which is very like that of an anchor escapement. The iron hoop has been removed later with just the right stub remaining. His engraving has certain aspects that make me think he did it himself, or he and his brother, Charles, that is. This is principally because they kept certain stylistic features for long periods of time. As time went by their engraved designs become simpler, less work, less refinement - to cut costs. It was always a problem for rural clockmakers to keep their clocks as cheap as possible in order to find buyers in a less-than-affluent market. Basically his earliest clock is the only clock so far which has a very finely-engraved and busy circle of floral strands and leaves arising from a tulip above VI and encircling the alarm disc, which carries a device often mistaken for a Tudor Rose but which is in fact the underside of a parrot tulip, that being the spectacular part. His second style of engraved centre, used on many clocks, carries a circle of more fully-drawn tulips, again arising from a central stem at VI. His third style used on lantern clocks (plate 11) shows a very stylised and simplified pattern of scrollwork, the tulips having gone completely. His chapter rings on all his earlier clocks have a sort of fleur-de-lys half-hour marker, which consists of three small circles joined together, each with a dot in the centre. 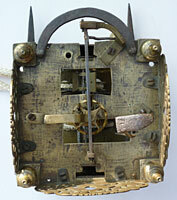 He used that pattern of chapter ring consistently for many years on all types of clock. His earliest clock however also has meeting arrowheads under the hour numeral, and this feature is not found on later clocks with this same fleur-de-lys. This is his only lantern clock recorded yet made with alarmwork. The alarmwork itself has been removed later (with the backplate it would have been attached to), but the disc remains and evidence of how the alarmwork once triggered, namely the hole that carried the front pivot end of the alarm trip. What appears to be extended end of that hole can be seen in the chapter ring just left of the XI numeral. When we examine the clock closely we can see he had trouble with this as he clearly made an error he would not have made if more experienced. The dial sheet shows two holes, the back of the chaptering shows a second hole, this second hole drilled only part-way through the chapter ring. What happened was that he first drilled the hole for the alarm trip arbor right through the dial sheet and the chapter ring, as was normal, positioning it just left of the XI. But when he came to assemble the clock he realised the hammer shaft would foul against it during striking. He therefore re-positioned the trip arbor to the left, so that it now sits just right of the X numeral on the chapter ring, but this time he did not drill right through but left the hole as a stopped hole, deep enough to carry the arbor in the dial sheet hole and a part recess into the chapter ring, without actually drilling right through the latter. Why didn't he drill right through this second time? Perhaps because it would appear ridiculous to have two detent holes showing on the dial front. 4. The tic-tac escapement seen from the rear. I have seen the Walter Archer fleur-de-lys chapter ring on an early-18thcentury hooded wall clock by Jones of Abingdon, which clock also had an unused Walter Archer type 2 dial centre for its base plate. Jones is well known for using spoiled or unwanted pieces in his clocks, a 'snapper-up of unconsidered trifles', so perhaps he bought these cast-off parts from Archer because they were in some way faulty - as we know he did from Knibb. More recently a hybrid lantern clock of the Walter Archer type by John Michell of Chardstock had a very similar chapter ring, when other clocks by Michell have quite different chapter rings. The implication is that Archer was supplying these people, not the other way round, and this also implies that he could engrave his own work. So what seems to be Walter Archer's first lantern clock is interesting not only for its own sake, but because it helps throw a little light on clockmaking practices of the period. It is only by examining such things that we can hope to learn what these men did and how they did it. For them it was everyday practice, and too mundane to bother writing down. Perhaps that is just as well, as it gives us a fascinating subject to investigate.